Search trademarks to rule out likelihood of confusion. This is part two in an ongoing series about why and how to register your trademarks. Erik J. Heels is both the founder of domain name, trademark, and patent law firm Clock Tower Law Group and the owner of many trademarks and domain names. Trademark searching is like scuba diving. You are never really done. But eventually you have to come up for air. The goal of a trademark search is (or should be) to help the trademark applicant make an informed business decision about whether proceeding with a trademark application makes sense. Each found trademark has to be compared with the applicant’s trademark to determine if there is a likelihood of confusion between the two. 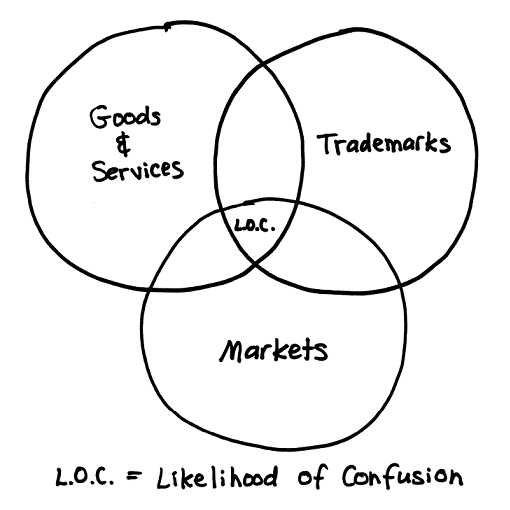 “Likelihood of confusion” is a legal standard that is interpreted on a case-by-case basis by the USPTO (during the trademark application process) and by courts (during trademark disputes). the markets are close enough. For example, imagine that one company makes a product called ACME SHOE STRETCHER that is used by shoe manufacturers to pre-stretch leather on the shoe assembly line. The product costs $50,000 and is sold exclusively at trade shows. Now imagine that a second company has a product call the ACME SHOE FETCHER that is a piece of plastic that attaches to slippers so that a dog can fetch the slippers without gumming them up. The product costs $1.99 and is sold via infomercials. The goods are both shoe-related. The trademarks are nearly identical. But the markets are completely different. So no likelihood of confusion. This is, of course, an oversimplification of the law, but I am painting with broad brush strokes here (plus likelihood of confusion jurisprudence itself is, ironically, confusing), so stick with me. If you have not yet started using your trademark (i.e. you are filing an Intent-To-Use (ITU) application), then the trademark search is more important than if you’ve been using your trademark for a long time. That’s because longtime concurrent use of similar trademarks without actual confusion is evidence that supports a finding of no likelihood of confusion. In short, there are two ways to establish trademark rights: by using the trademark and by filing a trademark application. It’s best to be first in both. USPTO Design Search Code Manual. For searching logos and the like. CIPO: Canadian Trade-mark Database. If a company has registered a trademark in the US and in Canada, then chances are they are more diligent about enforcing their rights. WIPO: Madrid Express Database. For searching international trademarks (I know, they are not really international trademarks, but that’s what everybody calls them) filed under the Madrid System (Madrid Agreement and Madrid Protocol). DomainTools Domain Search. It does you little good to have the trademark but not the domain name. Or vice versa. Domain Tools Domain Typo Generator. It does you little good to have the main domain name but not the typos. Register the typo domains. They will be registered either by you or by cybersquatters. It is inevitable. CheckUsernames. Find out which social media usernames have already been taken. Because Twitter matters too. Maybe even more than domain names. OneLook. Think you’ve made up a word? It’s a good idea to check a dictionary to make sure it’s not a real word. Google. An Internet “search engine.” Perhaps you’ve heard of it. My favorite paid database is SAEGIS from Thomson CompuMark. (Trivia: I beta tested SAEGIS in 1995 when I was working for sister Thomson company Lawyers Cooperative Publishing. I may have the oldest SAEGIS user account in the country.) I use SAEGIS more frequently for ITU applications than for use-based applications. SAEGIS allows you to search federal, state, and international trademark databases for literal and phonetically similar trademarks. The phonetic trademark search alone is worth the price of admission. The trademark search for RedStreet turned up no obvious problems, so I decided to proceed with a trademark application for RedStreet. But you already knew that. A trademark is to your business as a foundation is to your house.